For other people called Princess Olga of Greece, see Princess Olga of Greece and Denmark (disambiguation). Princess Olga, Duchess of Apulia (née: Princess Olga Isabelle of Greece, Greek: Πριγκίπισσα Όλγα της Ελλάδας; born 17 November 1971) is the daughter of author Prince Michael of Greece and Denmark and his wife, Marina Karella, an artist and daughter of the Greek business magnate Theodore Karella. Princess Olga is the wife of Prince Aimone of Savoy-Aosta, Duke of Apulia. Princess Olga grew up in Paris and New York, spending summers at the family's island retreat at Patmos, Greece. She chose to attend boarding school in England, studied history in Rome, and is a graduate of Princeton University. She also holds a degree from Columbia University's Graduate School of Architecture, Planning and Preservation. Although Olga worked for a while in interior decoration, she went to Panama to photograph and study phalaena. Later, as a lepidopterist, she helped to set up and then worked in the Liquid Jungle Lab in Panama in co-operation with the Smithsonian Tropical Research Institute and the Woods Hole Oceanographic Institution. She is also a journalist and filmmaker. Unlike other members of the Greek Royal Family, she was not deemed a full member of the Greek royal house under the monarchy, despite being born of a marriage recognized by King Constantine II of Greece (pursuant to Greek legislative decree 1298/1949). As daughters of a non-dynastic marriage, she and her elder sister, Princess Alexandra, are not accorded the traditional style of Royal Highness, nor do they bear the titular suffix "and Denmark". Her engagement to Prince Aimone of Savoy, Duke of Apulia, son of Amedeo, 5th Duke of Aosta, was announced in May 2005. Aimone and Olga are second cousins; both being great-grandchildren of the French pretender Jean d'Orléans, duc de Guise. 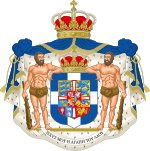 They are also second cousins-once-removed, as George I of Greece is Aimone's great-great-grandfather and Olga's great-grandfather. Olga's father, Prince Michael of Greece and Denmark, Aimone's late paternal grandmother, Princess Irene, Duchess of Aosta (née Princess Irene of Greece and Denmark), and Prince Philip, Duke of Edinburgh (born Prince Philip of Greece and Denmark), were all first cousins. The couple wed, after a three-year engagement, on 16 September 2008 at the Italian embassy in Moscow, the city in which Aimone is employed. Their religious marriage took place on 27 September at Patmos, where it was expected that the Patriarchal Exarch of Patmos, Archimandrite Andipas Nikitaras, would preside at the Church of the Evangelismos of the Virgin Mary at Pano Kambos, with a reception following on the site of a former school. Since the Second Vatican Council marriages celebrated according to the rite of the Ecumenical Patriarchate of Constantinople, to which the exarchate belongs, may be recognized as canonically valid. A canonical dispensation was obtained from the Catholic Archbishop of Moscow, Mons. Paolo Pezzi, who was the local Ordinary of prince Aimone. Present for the nuptials in Patmos were several members of Olga's paternal family, including Queen Sofia of Spain (née Princess of Greece and Denmark), former King Constantine II of the Hellenes and his consort Queen Anne Marie (née Princess of Denmark), Prince Michael of Greece and Denmark and his wife, Marina (bride's parents), and Princess Irene of Greece and Denmark. With the exception of 78-year-old Margherita, Dowager Archduchess of Austria-Este (née Princess of Savoy-Aosta), all members of the Aosta branch of the House of Savoy were in attendance, i.e. Prince Amedeo of Savoy, 5th Duke of Aosta (bridegroom's father) and his consort Silvia, Duchess of Aosta, Princess Claude of Orléans (aka Princess of France, bridegroom's mother), as well as Aimone's two full sisters, Princess Bianca Countess Arrivabene-Valenti-Gonzaga and Princess Mafalda Madame Lombardo di San Chirico, as well as Maria-Cristina (née Princess of Savoy-Aosta) and her husband Prince Casimir of Bourbon-Two Sicilies. From the senior branch of the Italian royal family Princess Maria Gabriella of Savoy (daughter of the late King Umberto II of Italy) was present, as she had been at the Athens wedding of Olga's parents in 1965. On 7 March 2009, Princess Olga gave birth to a son named Umberto in Paris, France. On 24 May 2011 in Paris, Olga gave birth to another son, named Amedeo Michele. A day after his birth Amedeo was granted the title Duke of the Abruzzi by his paternal grandfather. On 14 December 2012, Olga gave birth to a baby daughter, Isabella Vita Marina, in Paris, France. ^ "Talents et volonté". Point de Vue (in French). 1991-02-21. ^ Bern, Stéphane (1987-03-13). "Michel de Grèce: prince et romancier". Dynastie (in French): 12–15. ^ Huberty, Michel; Alain Giraud; F. and B. Magdelaine (1994). L'Allemagne Dynastique Tome VII Oldenbourg (in French). France: Giraud. pp. 329, 357. ISBN 2-901138-07-1. ^ Koenig, Marlene (2008-09-28). "Royal Musings". Translation of Patmos Times article. Marlene Koenig. Retrieved 2008-09-28. ^ Hubert Jedin, Konrad Repgen (1980). "The Code and Development of Canon Law to 1974". History of the Church: Volume X The Church in the Modern Age. Continuum International Publishing Group. p. 171. ISBN 978-0-86012-090-2. ^ "Le nozze tra le LL.AA.RR. il Principe Aimone di Savoia e la Principessa Olga di Grecia". Sito Ufficiale della Casa di S.A.R. il Principe Amedeo, Duca di Savoia. Archived from the original on 2009-01-05. Retrieved 2008-09-28. ^ "Michel et Marina de Grece: Trente Ans de Bonheur". Point de Vue (in French): 17. 14 February 1995. ^ (in Italian) Official announcement from the site of the Royal House of Savoy. This page was last edited on 1 April 2019, at 14:38 (UTC).